Jewelry does not have the equivalent of Fashion Week, a high profile setting where not only the press, but also the public can see the new collections instantaneously. The largest platform for jewelry to be shown to the world is, of course, the Oscars. On Sunday night at the Academy Awards, Tiffany brilliantly debuted pieces from its new High Jewelry collection with the help of Wonder Woman. What made the moment extra special was the jewels Gal Gadot chose to wear came from the first High Jewelry collection created under the direction of the legendary America jeweler’s new Chief Artistic Officer, Reed Krakoff. In the year Reed has held the position, he has deftly balanced Tiffany’s history with modern times. The new Home & Accessories collection has caused a sensation with playful items like the Bone China Paper Cups that conjure up images of Audrey Hepburn enjoying coffee in front of the landmark store in New York City. The “There’s Only One” ad campaign creatively captured millennials, Zoe Kravitz and Elle Fanning among others, in new jewels and iconic treasures. 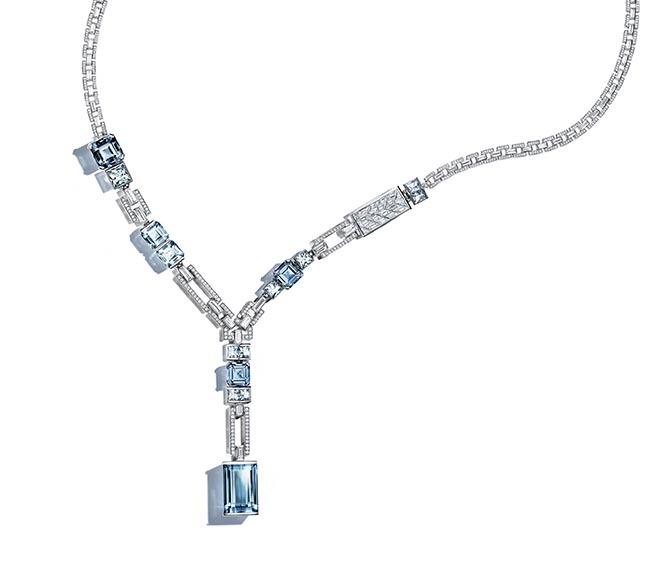 Design twists in the jewel include asymmetrical and somewhat elevated setting of the aquamarines. The rhythm of the larger stones is echoed in the chance pattern of the diamond and platinum links. The long slender necklace is the type of silhouette a silver screen star would have worn in the past that looks as youthful today as ever. During her fitting for the Oscars, Gadot was photographed by acclaimed lensman Renell Medrano wearing the necklace she appeared in on the red carpet as well as a choker from the Blue Book collection seen in the photo at top and the rendering below. The jewel is set with 11-custom cut aquamarines totaling 26-carats. Approximately 19-carats of diamonds in platinum highlight the blue gems.